“Transit Survey” was inspired by the surveying of Michigan and the effect that had on Michigan’s future. 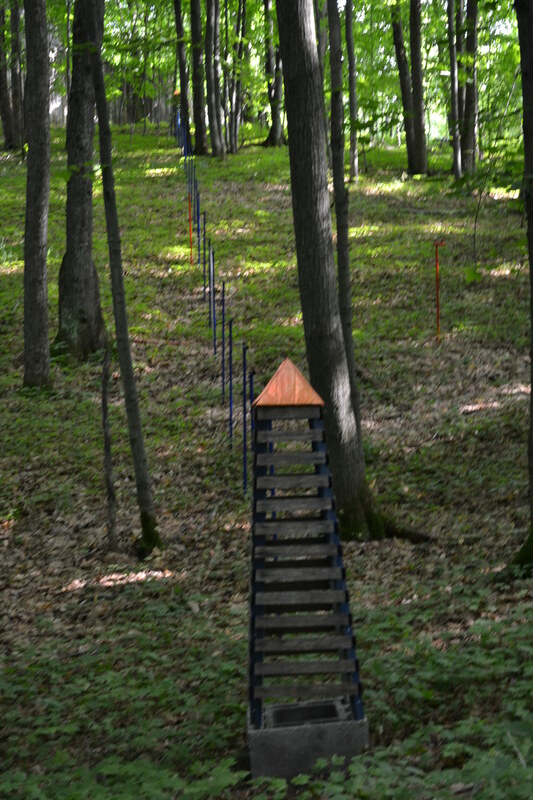 The surveying of Michigan began in 1815 by setting up an east-west Base Line (represented by red poles in this installation) and a north-south Meridian (blue poles) from which all land measurement would proceed. The obelisks represent the starting and ending points of the meridian and the baseline and the white pole the point where the two intersect. Michigan implemented the “rectangular system” of land measurement by setting up an east-west Base Line and a north-south meridian from which all land measurement would proceed. It was no easy task–surveyors exhibited courage, determination, integrity and ingenuity in the heroic feat of measuring their way westward. Their painstaking work produced innovative methods of establishing geographic boundaries and property ownership. In Michigan, the intersection of the prime meridian, which runs south from Sault Ste. Marie on the longitude of 84 degrees, 22 minutes and 24 seconds west, and the base line, is the referenced point for all lands surveyed in Michigan. Townships are numbered east and west and north and south of these lines. The USPLS system is still the primary means by which the location of parcels of land in Michigan are described. The “immaculate grid” of Jeffersonian democracy superseded the Spanish, French, and English territorial colonization of the New World. The surveys were conducted by individuals under contract with the United States surveyor general. The surveyor’s task was to run a line exactly straight in a given direction and to measure that line in units of one mile. He required two chainmen to measure the line and an axe man to clear the line of brush and to mark corners. A hardwood stake was driven into the ground at each section corner, with about a foot length left showing above the ground. The surveyor worked with a compass set on a tripod. Surveyors had to mark all trees along the line and to maintain careful records of the crossing of streams, ravines, and hills, the character of the soil and timber, as well as a description of each township. For this work, they were paid from $2.00 to $6.50 per mile surveyed. Working eight months a year, the surveyor could earn as much as $3,000, out of which he had to pay his assistants. According to the instructions issued to Michigan’s federal surveyors, all men employed in that capacity had to keep a book of field notes for every township and prepare and accompanying map. Michigan’s baseline, which today forms the northern border of Wayne, Washtenaw and other counties, survey was started fby Alexander Holmes. Although regulations governing the U.S. Public Land Survey System would later specify that the baseline should be a true parallel of latitude, this was not the case in earlier surveys, including the Michigan survey. A surveyor named Fletcher laid out the base line in ranges 3 and 4 east, but his work was grossly inaccurate and had to be resurveyed. In 1824, Joseph Wampler resurveyed Fletcher’s work and laid out the four townships cornering on the initial points. His corners are the ones accepted today. He found it necessary to establish two initial points where the Base Line intersects the Meridian in order to tie in the survey of the lands perturbation in its public land survey.already laid out east of the meridian. Hence a jog in the Baseline.